How is twitter valuable to businesses? With social media becoming more popular it is impossible for businesses to be competitive without them. In 2011, 77% of Fortune 500 companies have a Twitter account. This is an 18% increase from 2010. Twitter is valuable because it is so quick and easy. All businesses have to do is send one message and it is relayed to everyone that is following their account. Since twitter is mostly done through cell phones the message are received almost immediately. Just like any social media Twitter can be very dangerous for companies. If a message is misunderstood or offensive the message could lose clientele. It is very important to always have someone other than the author reading over Tweets before they are sent out. The most important aspect for any business to understand when using Twitter is the SEO benefit. SEO stands for Search Engine Optimization. In short this means that you want your account to be one of the first to show up on the screen when the key words of your account name are searched. If it isn’t at the top of the list most people won’t waste their time searching through pages to find it. Making things easier on your customers will be the most beneficial. Twitter should also only be used for business information not for personal opinions. 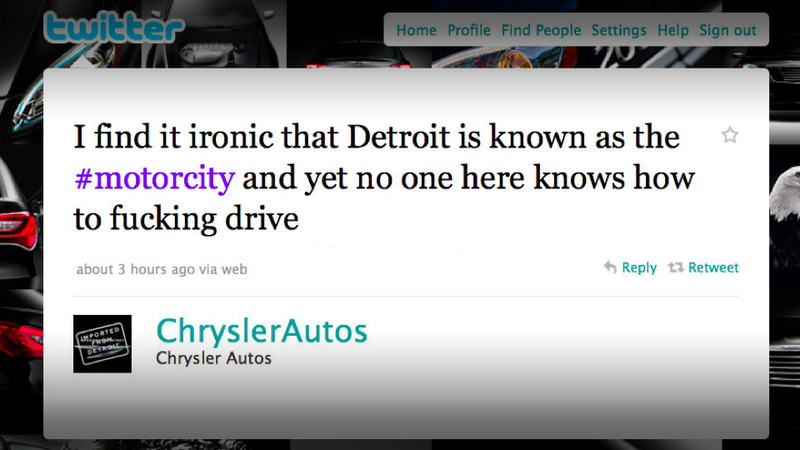 There is an example below showing a bad tweet that was posted by Chrysler. Here is a list of useful tips that can be used when starting a Twitter account for your business. Make sure your Twitter name is either your company name, or slogan. Be as active as possible in your tweets or people will stop following you. Add your company logo and colors to your Twitter page. Add your Twitter account to your phone so if you are traveling you can still update it with important news. Never use a business Twitter account for personal opinions.